Captain America: Civil War picks up where Avengers: Age of Ultron left off, as Steve Rogers leads the new team of Avengers in their continued efforts to safeguard humanity. After another international incident involving the Avengers results in collateral damage, political pressure mounts to install a system of accountability and a governing body to determine when to enlist the services of the team. The new status quo fractures the Avengers while they try to protect the world from a new and nefarious villain. 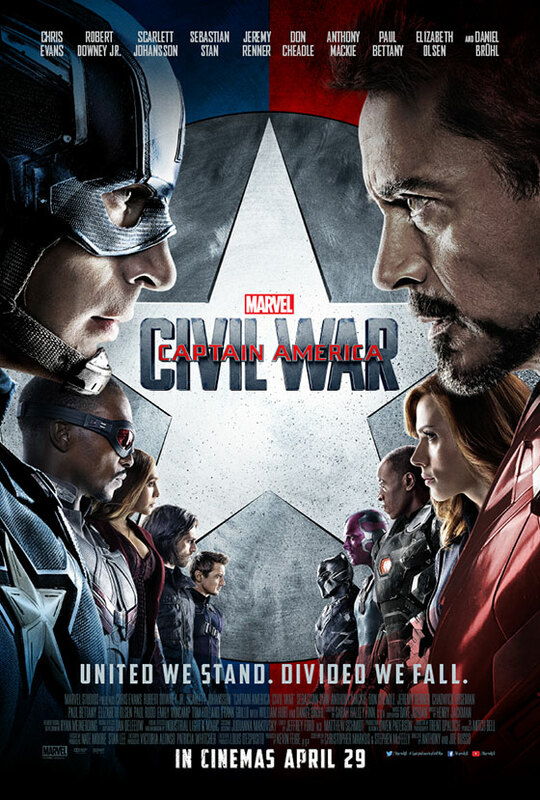 Set for release in the United Kingdom on April 29th 2016, Captain America: Civil War is directed by Anthony and Joe Russo; and stars Chris Evans as the iconic Super Hero character Steve Rogers/Captain America along with Robert Downey Jr. as Tony Stark/Iron Man, Scarlett Johansson as Natasha Romanoff/Black Widow, Sebastian Stan as Bucky Barnes/Winter Soldier, Anthony Mackie as Sam Wilson/Falcon, Paul Bettany as The Vision, Jeremy Renner as Clint Barton/Hawkeye, Don Cheadle as Jim Rhodes/War Machine and Elizabeth Olsen as Wanda Maximoff/Scarlet Witch.